A survey has been distributed to all households in the parish over the last week. 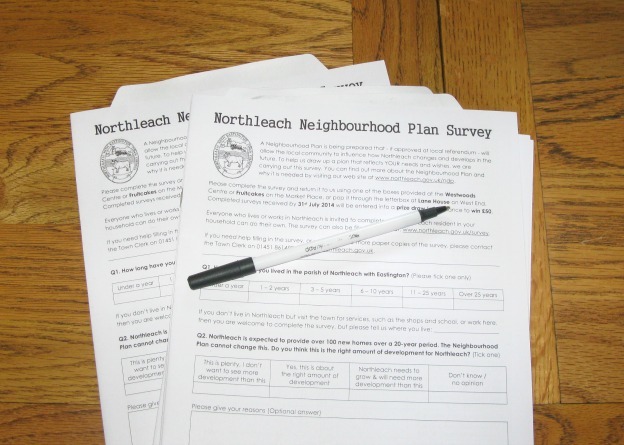 The survey will provide vital information to help us create the Neighbourhood Plan, which is a “blueprint” for how we wish the town to develop between now and 2031. There will be changes! As you may be aware, Northleach is already subject to a planning application for development on the land at Bassett Road. Your responses will help the Town Council secure the right type of development in Northleach and the infrastructure changes needed to support that development. Please take the time to complete the survey. Return your survey by 31st July and you can enter a prize draw for a chance to win £50! Completing the survey online will save us time later, since we won’t have to manually enter the data into a computer. But if you’re not comfortable with the online version, don’t force yourself to use it. The most important thing is that you complete the survey. We need as many responses as possible! More responses carry more weight when the Town Council engages with the local planning authority and housebuilders over future development. Your answers will help the Town Council to secure a better future for Northleach.